Hi Coco, Welcome to cats around the globe. I really hope you still have a happy life despite being ill. Better care for cats can prevent this! My name is Coco and I am one year old. I was adopted when i was 3 months old. I had a horrible life before that. I was the only survivor after my brothers and sisters were brutally killed by children. After everything I have been through I was very happy to be adopted. I love my new feline brothers and sisters. Some were adopted like me and others were rescued. I love to headbutt and to sleep under the blanket curled up with my human mom and dad, whom I love very much. Before being adopted I had been tested for FIV (Feline immunodeficiency virus) and FELV (feline leukaemia virus). I tested negative for both. Mom noticed I had really bad gingivitis so she took me to the vet. The vet felt I had to be tested again because gingivitis in kittens is really unusual. I knew immediately that it wasn’t good news because my mom cried for hours that day. All over South Africa and many other countries, most cats and kittens that test positive for fiv and/or felv are immediately euthanised. Mom was told that If I had tested positive at the adoption centre I would have been euthanised. She felt that euthanasia was an inappropriate reaction against hearing I had fiv. She loves me very much and promised to take care of me forever. My gingivitis is much better and I am living happily with my brothers and sisters as indoor cats. 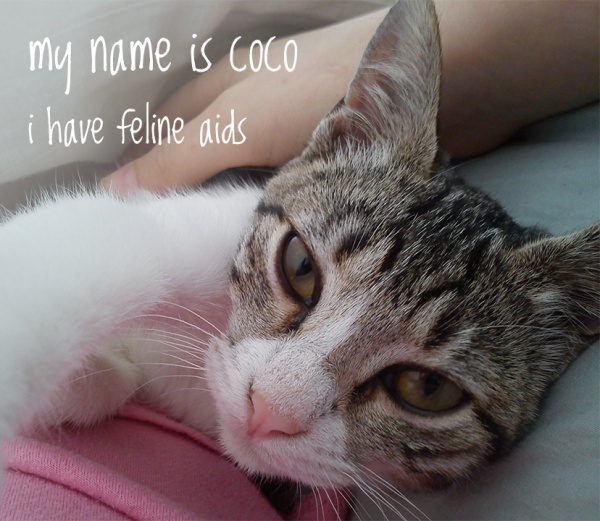 Please help me save feline aids kittens and cats like me from being killed. By helping me raise funds to create an animal sanctuary and adoption centre in Cape Town, South Africa. The sanctuary will help stop the killing of innocent FIV positive cats and give them a chance at life. Maybe they will be as lucky as i was and be adopted but if not they will always have a home at the sanctuary. • fiv and felv: Most people don’t even know there is such a thing as fiv and felv. We believe that raising awareness about these viruses can be a way to prevent cats (especially those that roam freely) from becoming infected in the first place. If people know about fiv and felv, more cats can be tested and fewer cats might go undiagnosed and suffer until it is too late. Instead of immediate euthanasia these cats can then receive the proper veterinary care that will increase their chances of living long, happy, healthy lives. We would like to be able to bring groups of children to the coco and co animal sanctuary to learn kindness and compassion towards animals. Our hope is that these children can then become animal protectors instead of abusers.